Furloughs Only The Latest Blow To Federal Worker Morale Government work was once synonymous with job security and stability. But these days furloughs, pay freezes and threats of further cuts are fomenting discontent. Some federal employees also say that public criticism of the federal government is also taking a toll. 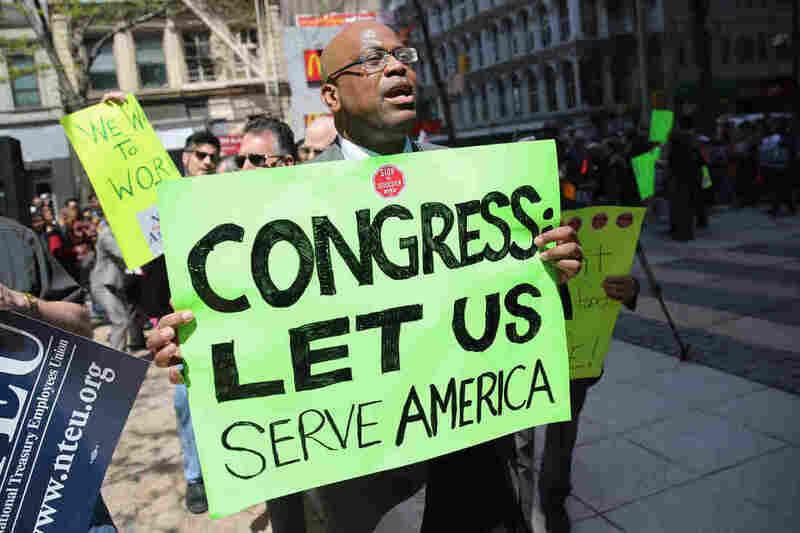 Federal employees demonstrate against the U.S. budget sequester, outside New York's Federal Plaza on Tuesday. Federal workers say they don't have much to celebrate these days. Furloughs began in April, exacerbating already low morale for many government agencies as budgets have tightened. Downsizing has meant more work for those who remain, and talk of further cuts has many worried about job security. This year is also the third that federal workers haven't received a pay increase, contributing to discontent. Jenny Brown is in her 27th year as an examiner for the Internal Revenue Service, where she answers peoples' tax questions. The IRS is a major employer in Ogden, Utah, where Brown works, but her co-workers are getting fed up and leaving — and they aren't being replaced. "We keep being told things like, 'Work smarter, not harder.' Or, 'Well, you're just going to have to do more with less,' " Brown says. "And there's only so much you can do." As a result of understaffing, Brown says, wait times on the IRS hotline have quadrupled. And after more than an hour waiting on the phone, taxpayers get downright ornery. "We hear, you know, 'This is ridiculous. I don't have all day to spend on this,' " Brown says. "They're frustrated and they need to vent when they finally get us on the phone. Which, obviously, just takes us even longer to get to the next call." The problems don't end there. Brown says her office recently ran low on paper and ink and was told it could not afford to restock. Brown recounts a recent meeting where a co-worker was doodling. "A management official was just joking," she says, but "he said, 'Be careful with that ink. You don't want to waste it. We may not be able to buy more.' "
In Detroit, 1,600 miles away, Ryan Gibson works as a Customs and Border Protection officer, monitoring for terrorists and drug traffickers at entry points along the Canadian border. He fell in love with the work a decade ago, he says. "I remember the first big apprehension that I had as an officer. I was on an adrenaline high for days to come," he recalls. "I felt like, 'Man, this is what I want to do.' "
Gibson says the Boston Marathon bombings highlight the need for law-enforcement jobs like his. Yet Gibson says many officers feel undervalued. He says a colleague he overheard in the hallway illustrates the problem. "You know what's sad?" the colleague said, according to Gibson. "That this place doesn't care about employee morale." Gibson, who is local president of the National Treasury Employees Union, says the attitude starts with politicians in Washington and trickles down. "You're disrespected every day at work by your own employer," he says. "You're disrespected by the members of [the] public every day because they don't understand what you do and how you do it, and ... they feel that we're just there collecting a paycheck, not doing anything, and we have all these fringe benefits that we shouldn't be entitled to. "What's the positive out of it?" Gibson asks. "Where's the — you go home and feel good about the job that you did?" Even before the furloughs, federal-worker morale was on the decline. Last year's annual Federal Employee Viewpoint Survey by the Office of Personnel Management showed government employees were both less engaged and more dissatisfied with their jobs than the previous year — largely, but not exclusively, because of stagnant pay. Satisfaction with pay decreased four percentage points from 2011 to 59 percent. And "global" job satisfaction — measuring not only job satisfaction but also things like happiness with pay and the organization — declined to 63 percent last year from 66 percent in 2011. "People are human," Foley says. "They respond to criticism of government employees. And so that's something that [has] unfortunately been on the increase." Among federal agencies, the National Archives and Records Administration ranked the unhappiest in the 2012 survey; only 50 percent reported being satisfied. Darryl Munsey, president of the bargaining unit representing those workers, says he was not surprised by the results. Munsey's been working 40 years at the agency, where, among other things, he buys specialized boxes, folders and polyester sleeves that preserve the nation's historical documents. "We are much, much more careful this year than we have ever been before in trying to figure it down to the last box of how many we need," he says. Munsey says the jobs and the archival history he's fighting to save are treasures undervalued by both Congress and the public. "One of my great, great sorrows in life is I feel like, because I am president of this organization, that I should be able to do something to mitigate it," Munsey says. "But it is so difficult, that it's [like] trying to fight an octopus in a cave, underground, that has just squirted you with ink." What's hard to accept, Munsey says, is the real possibility that this is his new normal.